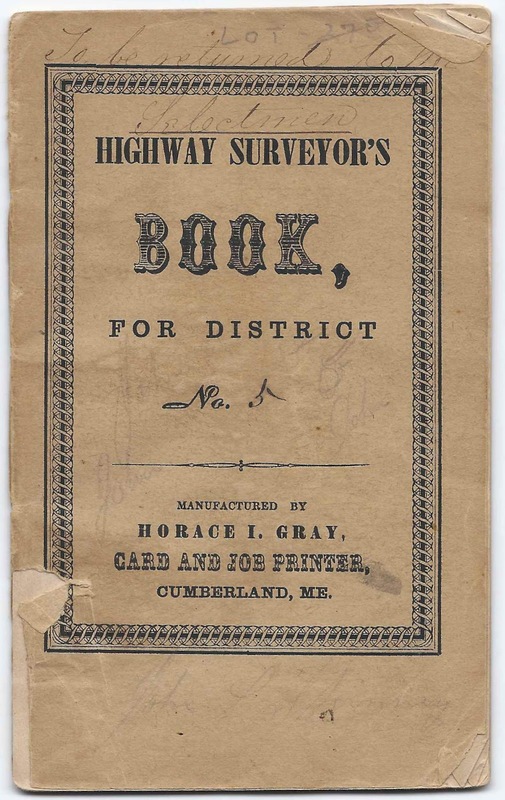 1870 Highway Surveyor's Book for District #5 at Eliot, Maine, that belonged to Gilman Raitt, who spelled Eliot as Elliot. 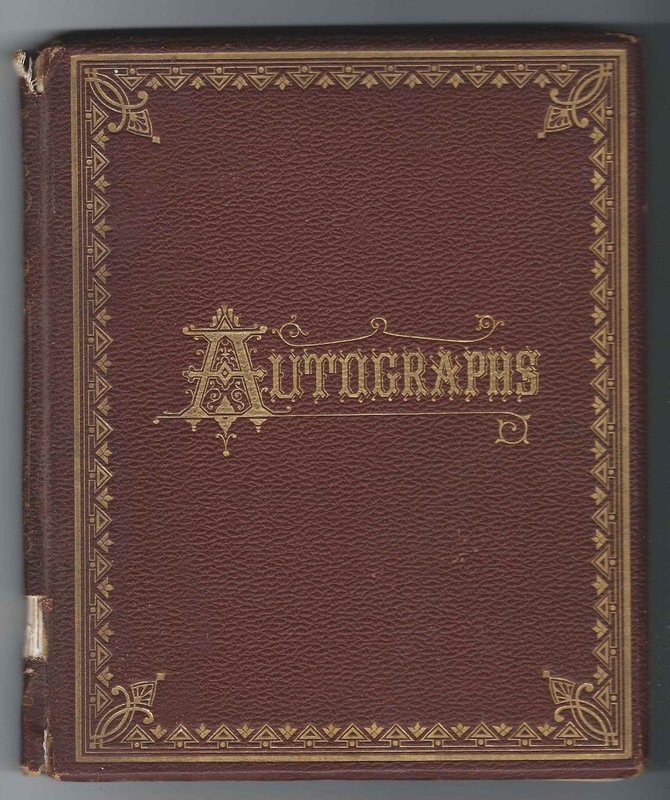 The booklet measures approximately 6" x 3-3/4" and contains 14 interior sheets, with a few pages of printed text, a few pages of handwriting and a larger number of blank lined pages. 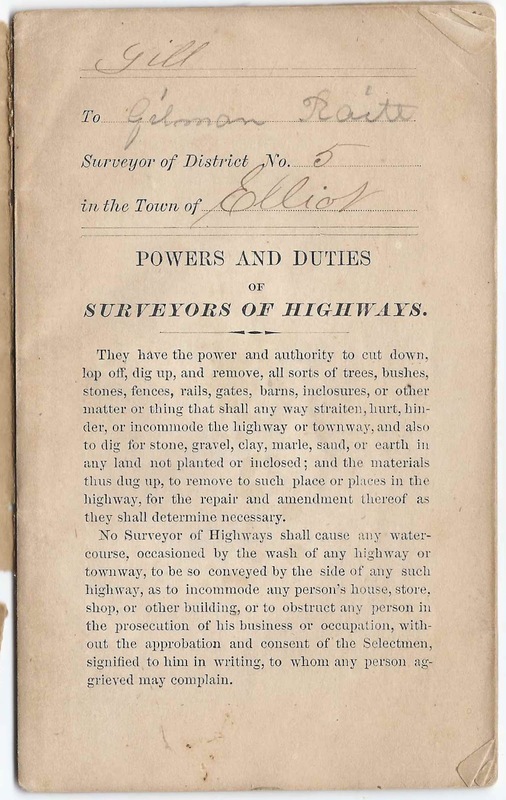 It names various landowners in Eliot and their assessments. 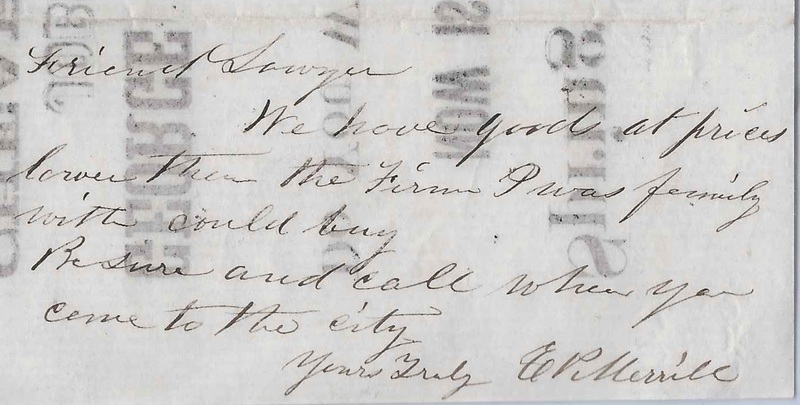 Gilman Raitt was born 28 July 1818, the son of John B. Raitt and Anna (Marsh) Raitt. On 2 November 1843, Gilman married Mary Nason, daughter of William Nason and Sarah Whitehouse (Wilkinson) Nason. The couple had, I believe, three children. 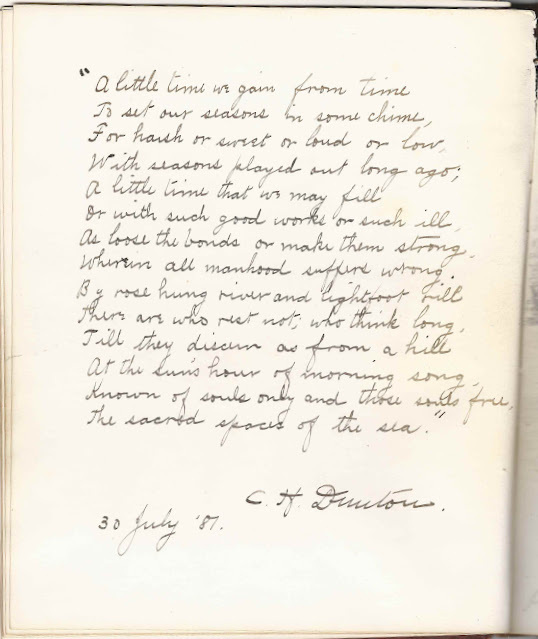 Gilman died in 1882. He and Mary are both buried at Eliot, Maine. 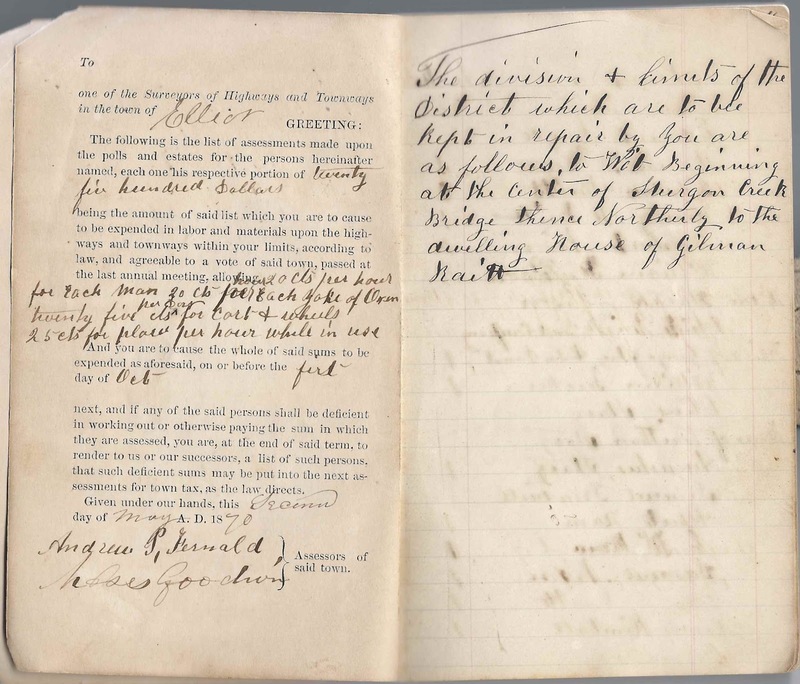 The page at left, above, is signed by Assessors Andrew P. Fernald and Moses Goodwin. The portion of roadway under Gilman Raitt's supervision is shown as from the center of Sturgeon Creek Bridge to his own property. 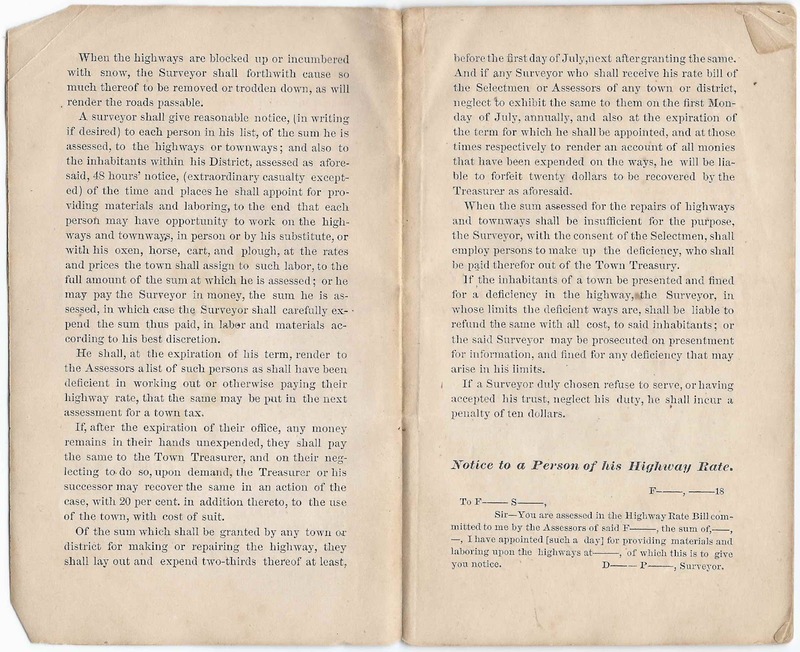 The names on the page above - "Persons who have not worked out their tax"
If you have information on the family of Gilman Raitt or any of the other people mentioned in this booklet, please leave a comment or contact me directly. Thanks for stopping by! 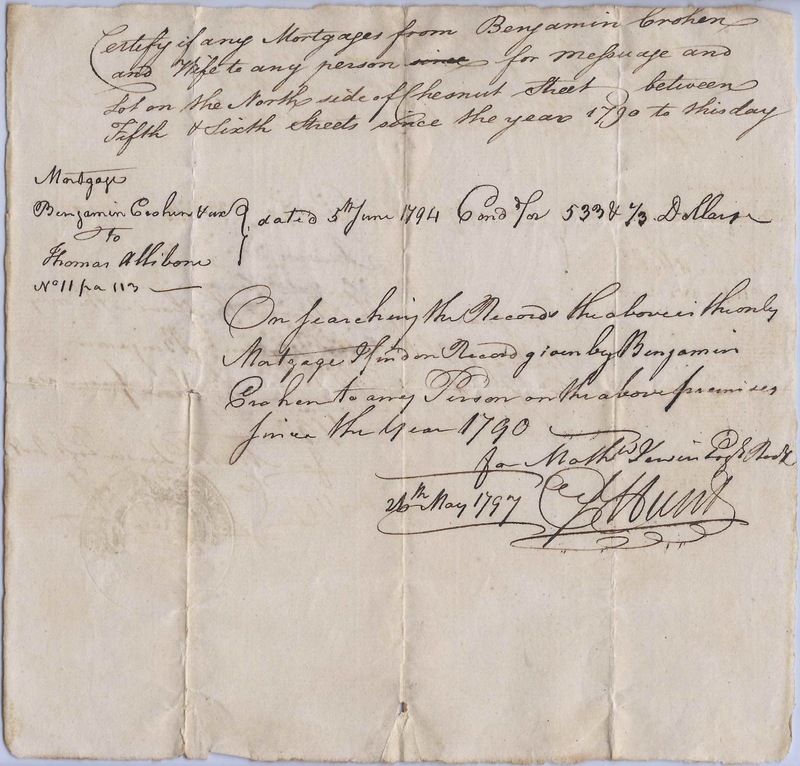 October 21, 1803 Freeport, Maine, handwritten document, with names of Ralph Cross, Ezra Ames and M. A. Cross. 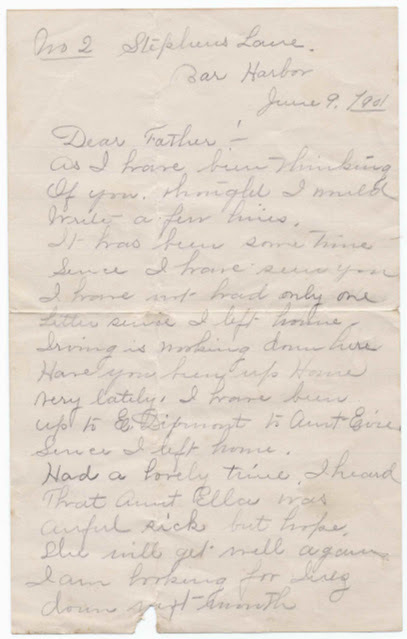 See another document concerning Ralph Cross. For Value Received of Ralph Cross, I promise to pay him or his order the Sum of nineteen dollars and fifty seven cents on demand with interest. 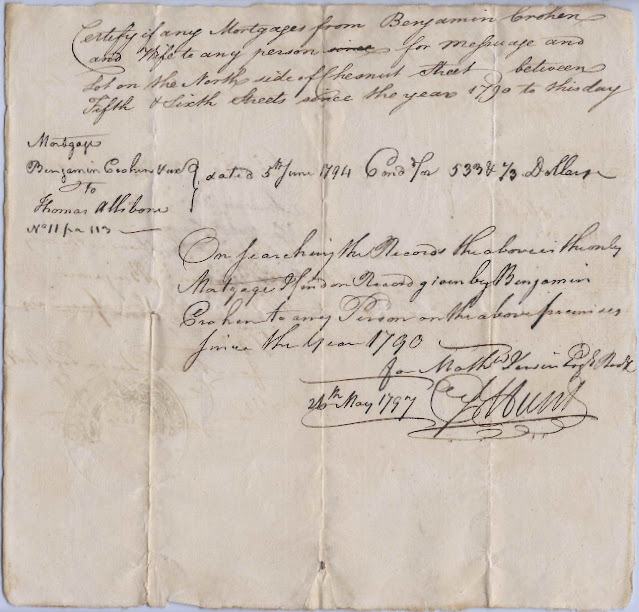 Ralph Cross was likely the Ralph Cross born about 1764 and a merchant at Portland, Maine, who started a store at Freeport, Maine, about 1800. 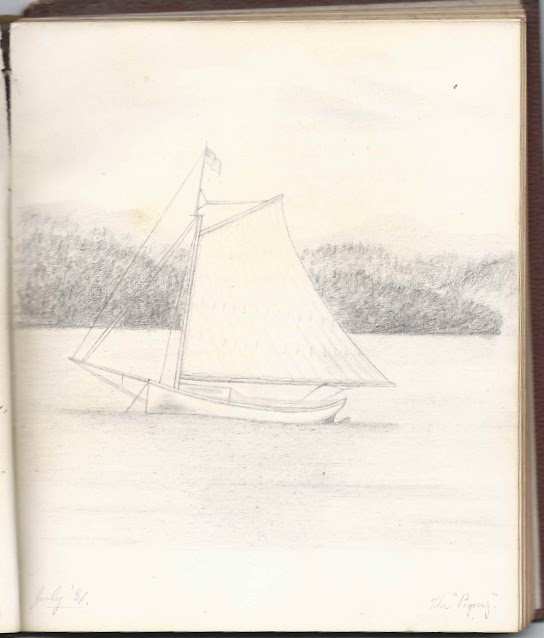 He died 15 October 1815 at Portland, Maine. There was an Ezra Ames born 22 April 1769 at Lewiston, Maine, son of James and Elizabeth (Hall) Ames. 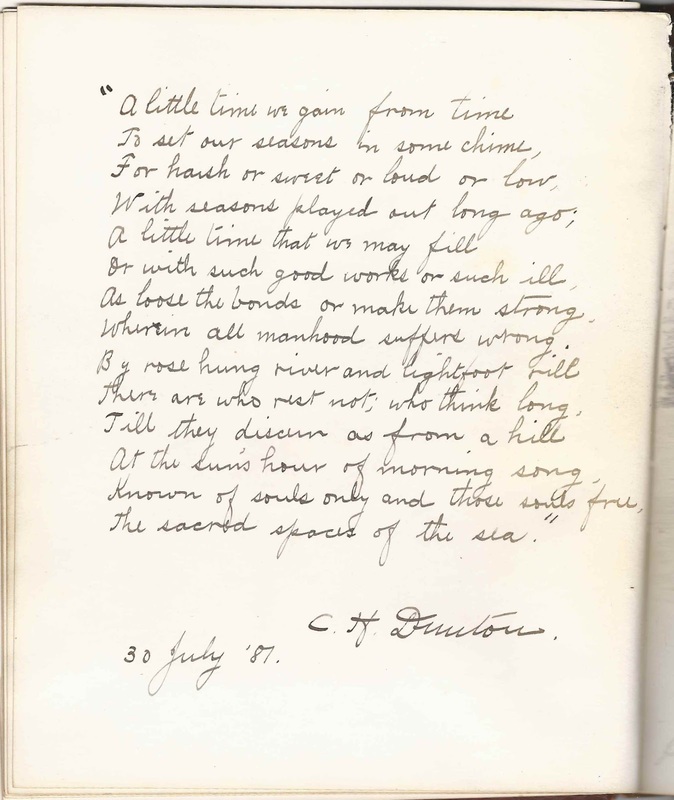 He married Lucy Garcelon, daughter of James and Elizabeth (Annis) Garcelon. I'm not sure that Ezra was the person who made out the document, however. And I'm not sure who M. A. Cross was, but perhaps a Cross relative hired to run the store at Freeport. If you have more information on the three people mentioned in the document above: Ralph Cross; Ezra Ames or M. A. Cross, please leave a comment or contact me directly. Thanks for stopping by! Handwritten document of November 20, 1804, Windham, Maine, with names, I believe, of William Hanson and a Joseph, whose surname might be Scribner or Sanborn, Jr. or Sr., or a longer surname, where the latter indicated that he owed William Hanson the sum of $3.41. 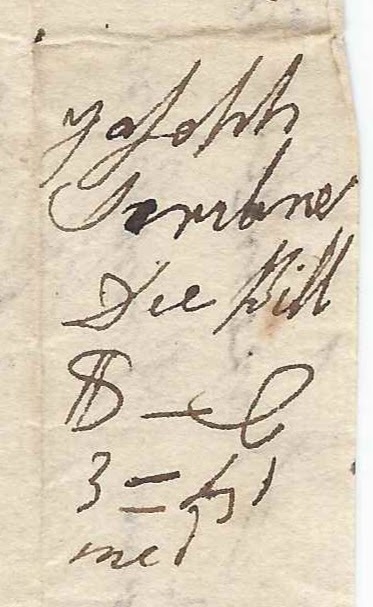 Joseph's handwriting isn't all that clear, but I did find a William Hanson at Windham, Maine, born 18 January 1762, who died at Windham, Maine, on 29 October 1814. He and his wife Matilda (Elder) had, I think, eleven children. See another document with the name of William Hanson of Windham, Maine, here. 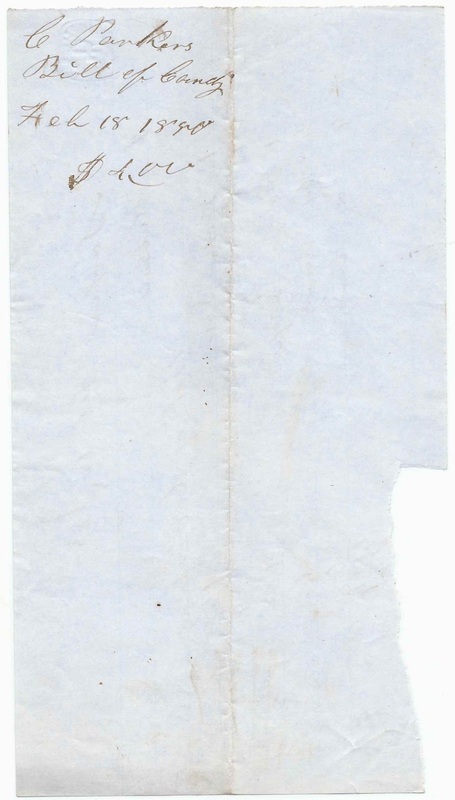 As mentioned above, I'm not sure of the name of the person making the document. 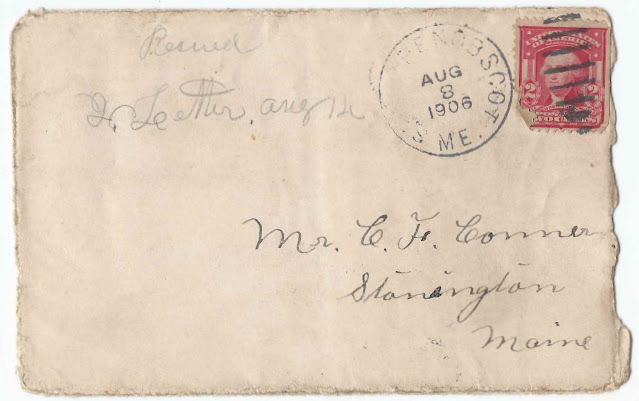 If you know of a Joseph Scribner or Joseph Sanborn, either Jr. or Sr., living in the Windham, Maine, area around 1804, please leave a comment or contact me directly. Thanks for stopping by! 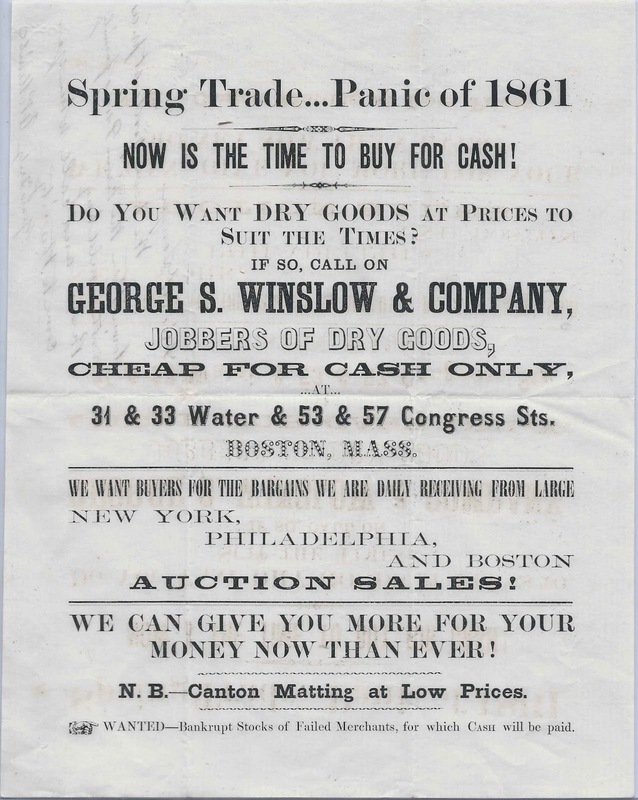 Circa 1861 ad sheet for George S. Winslow & Company, Jobbers of Dry Goods, at 31 and 33 Water and 53 and 57 Congress Streets, Boston, Massachusetts. The sheet is approximately 9-3/4" x 7-3/4". 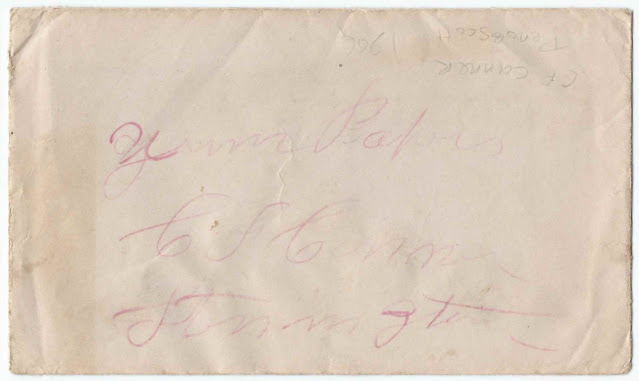 There's a note on the reverse by salesman E. P. Merrill, addressed to Friend Sawyer, that Merrill is now working for this firm and is able to offer lower prices than previously. 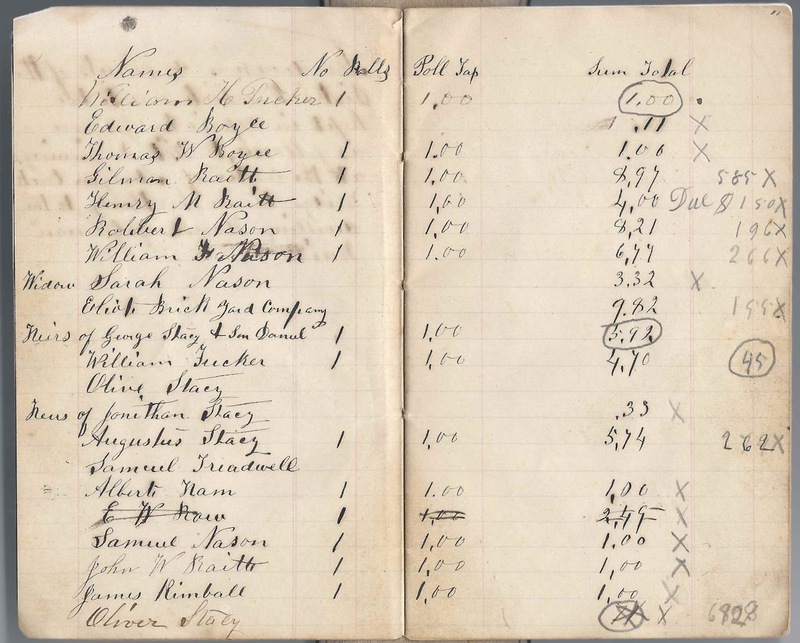 George Scott Winslow, Sr., died on 9 October 1880 at Somerville, Massachusetts. His estate wasn't finally settled until 1953. 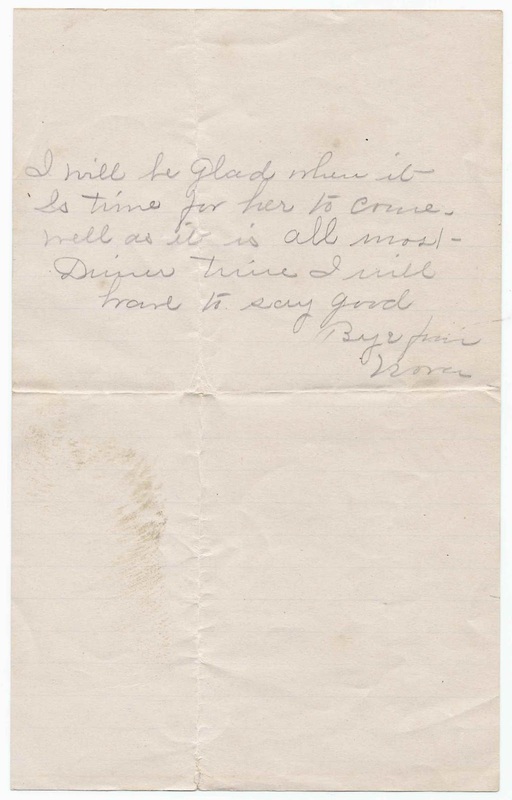 If you have a theory as to the identity of E. P. Merrill, please leave a comment or contact me directly. July 11, 1865 document written at Springfield, Maine, showing where Eastern Express Company delivered a package containing $100.75 from N. G. Hichborn to Alvin Leavitt at Drew Plantation, signed as received by Almon Leavitt. 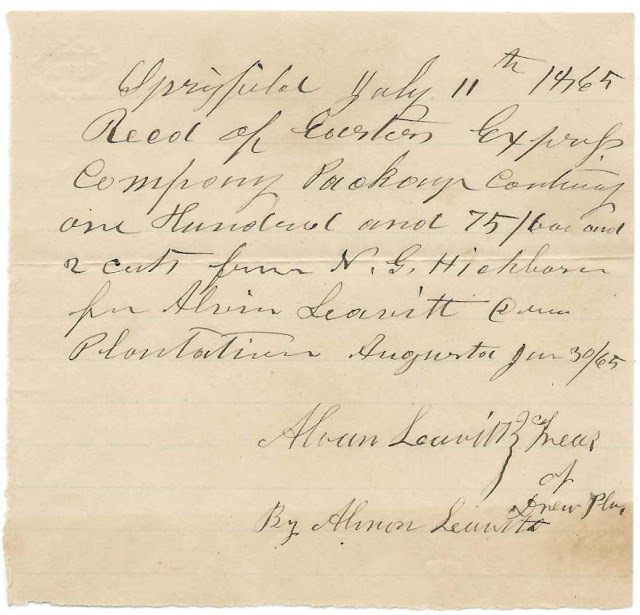 May 17, 1866 document written at Springfield, Maine, showing where Eastern Express Company delivered a package containing $207.62 from N. G. Hitchborn to Alvin Leavitt, Jr. of Drew Plantation, signed as received by Almon Leavitt. 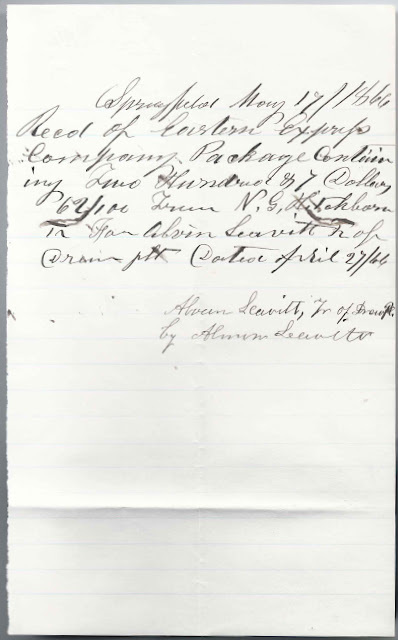 Almon Leavitt was born 12 April 1837 at Turner, Maine, the son of Alvin and Susannah Leavitt. 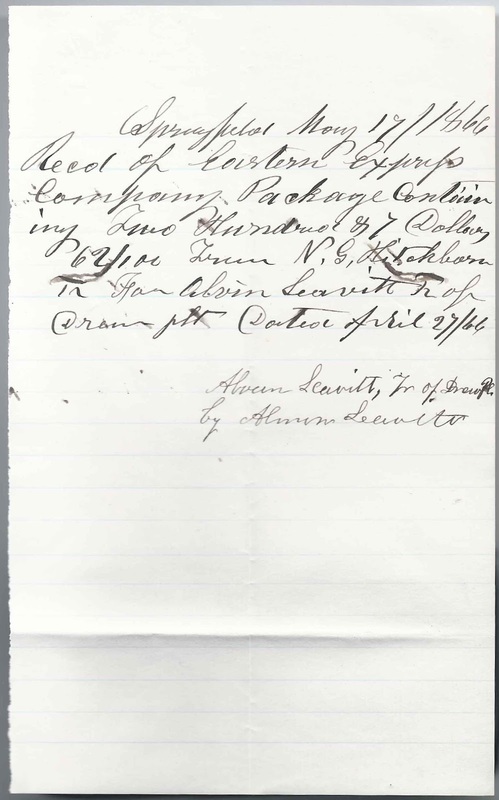 My research shows that Alvin Leavitt was the son of Isaiah Leavitt and Lydia (Ludden) Leavitt. I'm not sure where the use of Jr. came in. 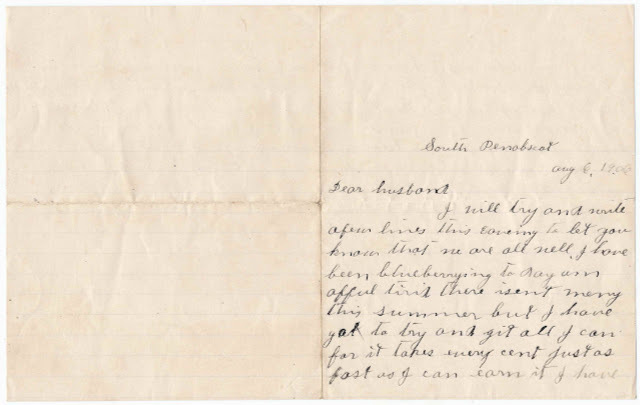 Sometime between the enumeration of the 1850 and 1860 Census, Alvin, Susannah and their children moved north to Penobscot County in the area of the town of Springfield. 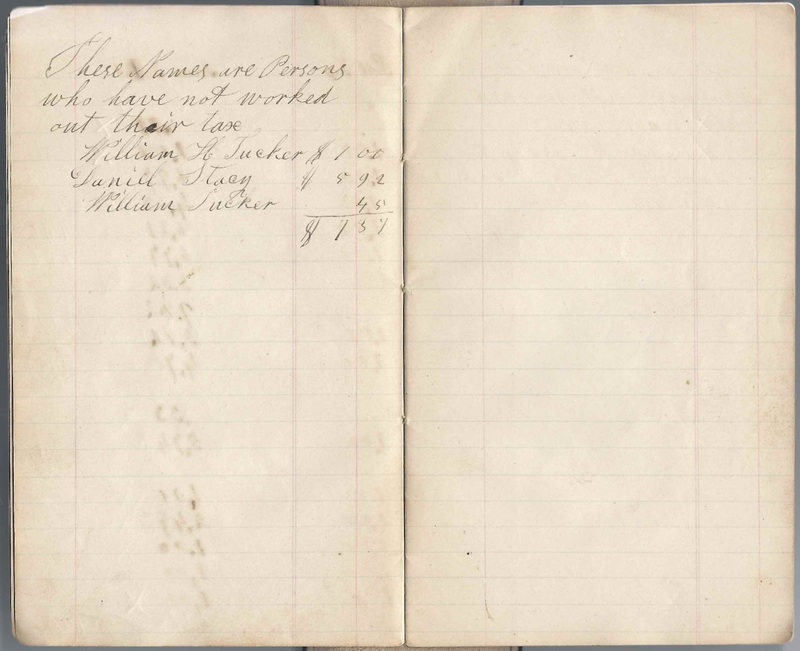 In the 1860 Census, Alvin was farming, and two of his sons, one of them Almon, were teaching school. Alvin died in 1868 and is buried at Turner, Maine. 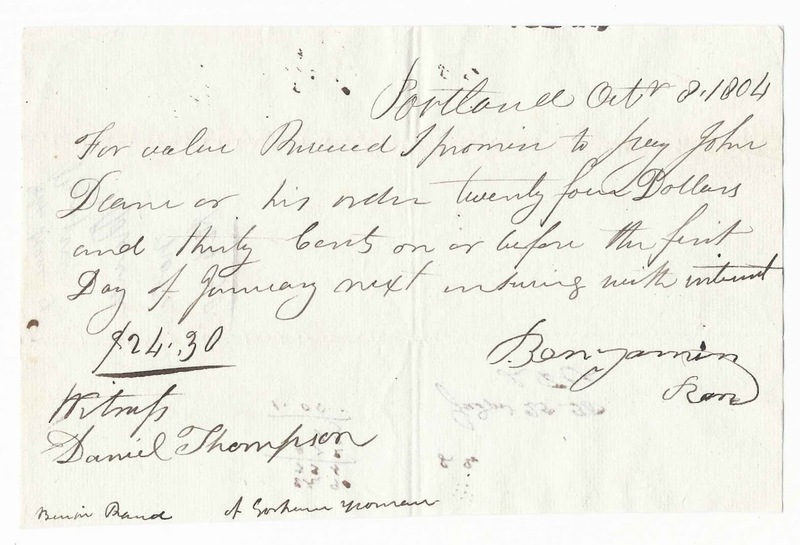 By 1870, son Almon was living at Independence Plantation, now Kingman Township. Drew Plantation is adjacent to Kingman Township. Almon operated a tannery, a shingle mill and a steam mill and served as a town clerk at Kingman Township; it's likely that his father was also involved in these ventures. As for N. G. Hitchborn, I'm not sure who he was, but there was a Nathan G. Hichborn who ran a store and shipyard at Stockton, Mainer. 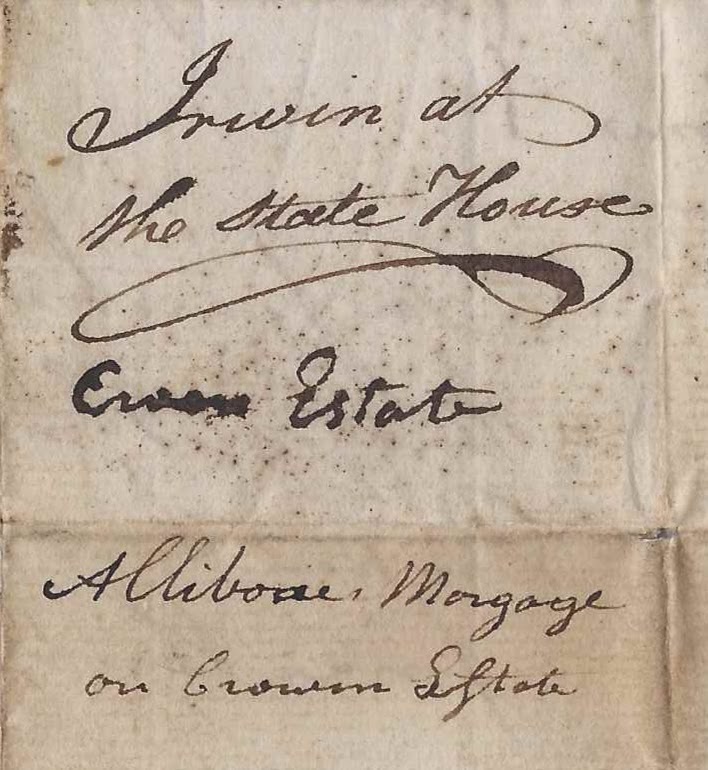 Just before the year of this document, he was elected Treasurer of the State of Maine, but I assume his business interests carried on. 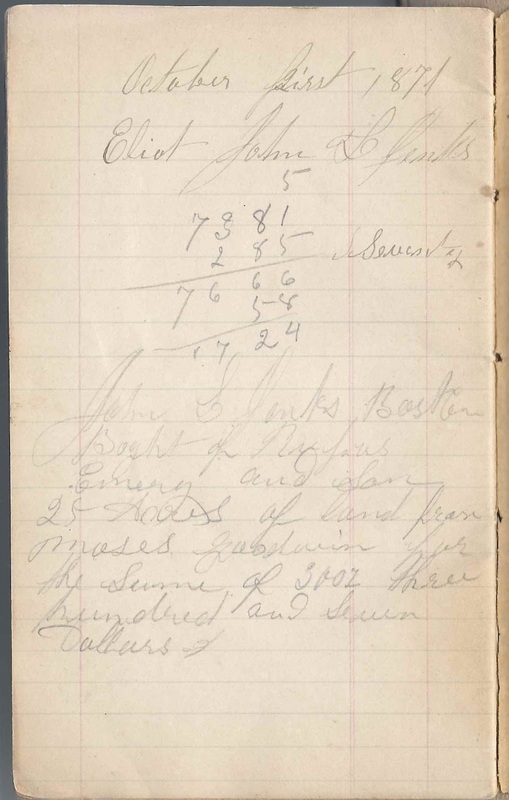 It's possible that this was a transaction with the State of Maine or perhaps it reflected an order for the store or shipyard. If you have corrections and/or additions to the information above, please leave a comment or contact me directly. Thanks for stopping by! 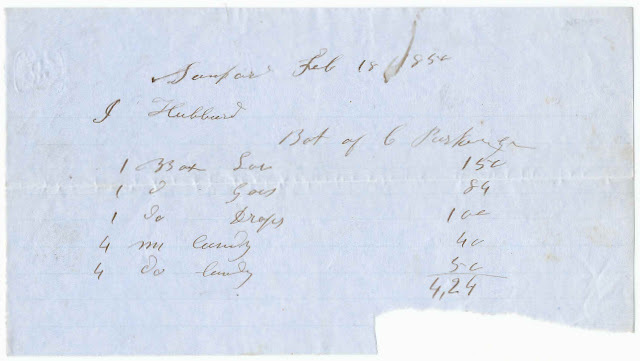 November 15, 1849 handwritten document written at Sanford, Maine, and bearing the names of Dr. George Weld, James Hubbard, Stephen Wilkinson and J. H. Kimball. Another post features five documents/letters from Saco, Maine, Sanford, Maine, and Portland, Maine, that are all addressed to a Mr. Hubbard, presumably the same Mr. Hubbard as above. Please pay to James Hubbard or his order Eleven Dollars & forty nine cents and charge the same amount to me. I will account to you for the same amount and ? 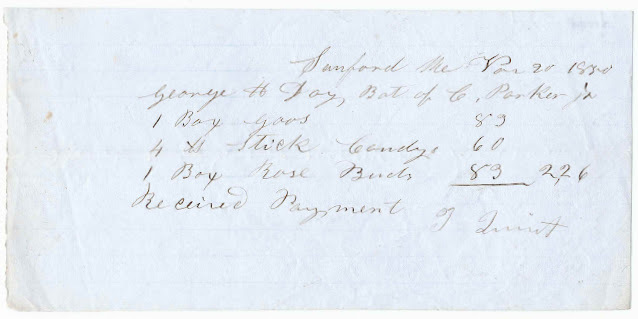 Dr. George Weld was born 8 September 1796 in Vermont, the son of Samuel and Sally (Hayden) Weld. On 15 June 1828 at Lebanon, Maine, he married Theodosia Wentworth. 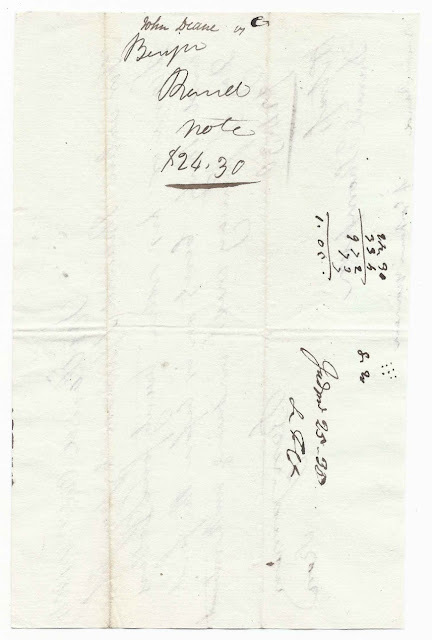 They had at least two children, at least one of whom, Sally W. Weld, died young at Lebanon, Maine, on 8 November 1834. 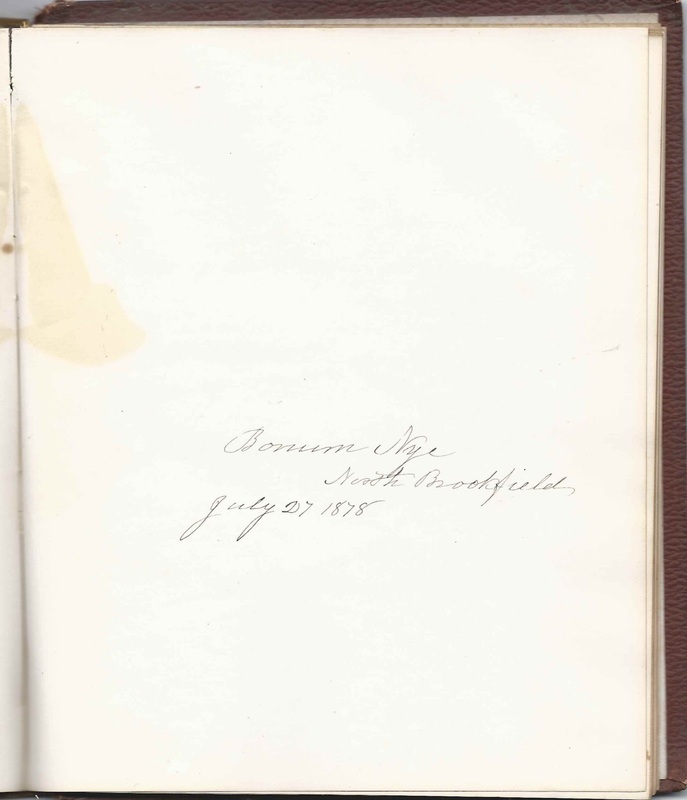 Dr. Weld died at Sanford, Maine, on 17 July 1854. 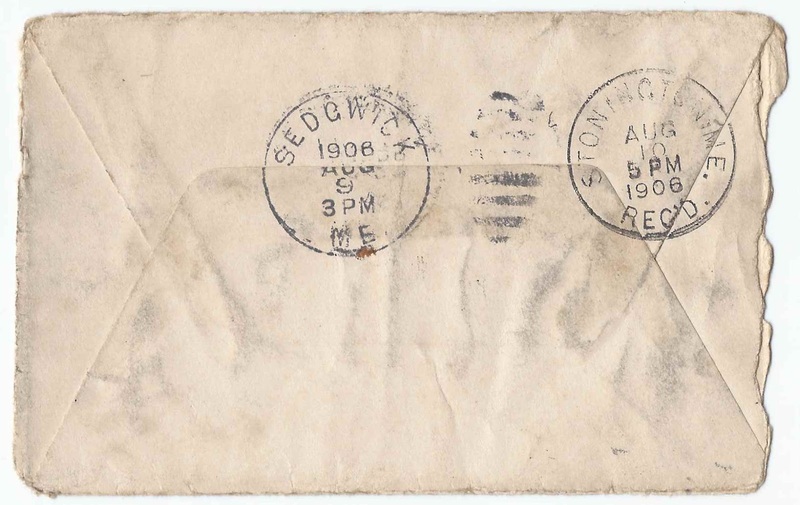 There were a father and son named Stephen Wilkinson in the Sanford, Maine, area, during the relevant time frame. The father was born about 1808, the son of James and Sally (Thompson) Wilkinson. 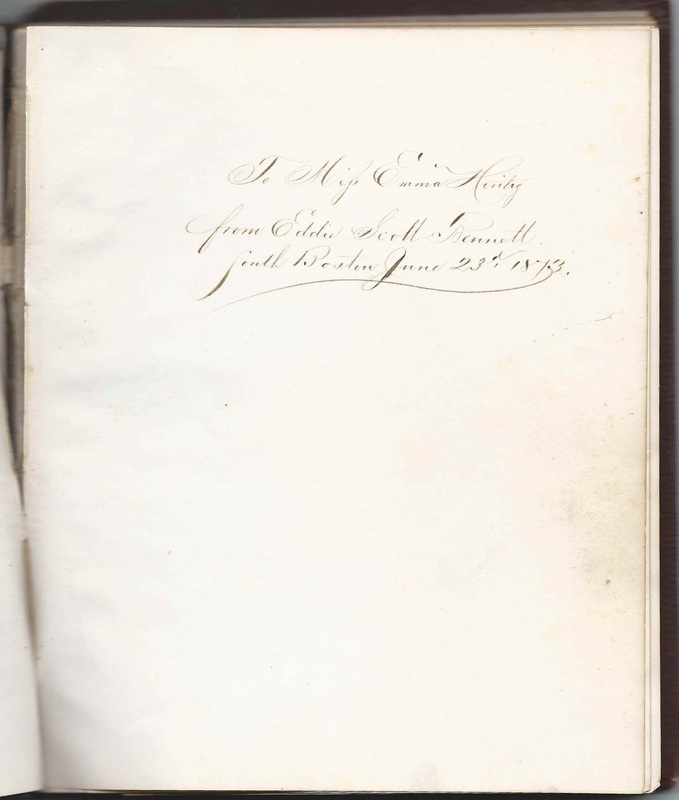 His son Stephen was the firstborn of, perhaps, eight children with wife Susan (Lord) Wilkinson. Though there were several James Hubbards in the area, a James Hubbard, born about 1812, son of William Hubbard, was living in Sanford, Maine, at the time of the 1850 Census. 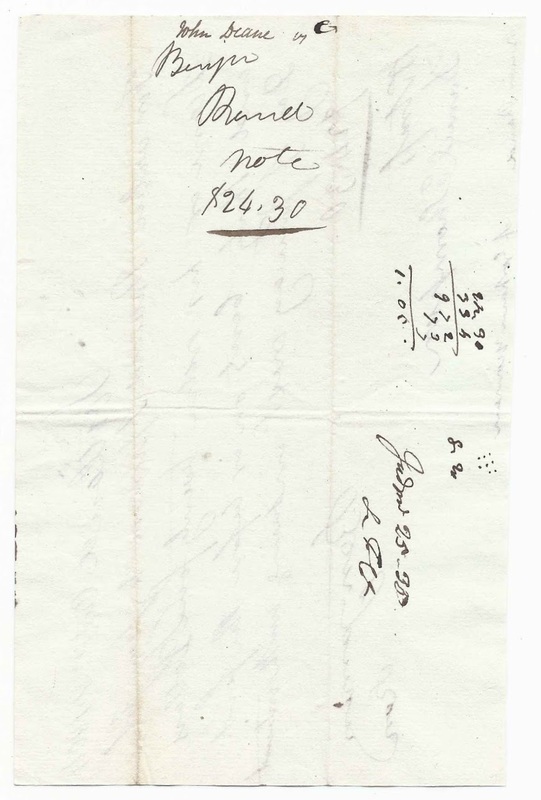 That James Hubbard married Hannah Adams of Gilmanton, New Hampshire, on 16 May 1834. About 1854, they joined a colony of settlers who went to Grinnell, Iowa. Read more about them here. J. H. Kimball may have been John Horne Kimball, born 20 May 1811 at Shapleigh, Maine, son of Nathaniel and Mary (Horne) Kimball. 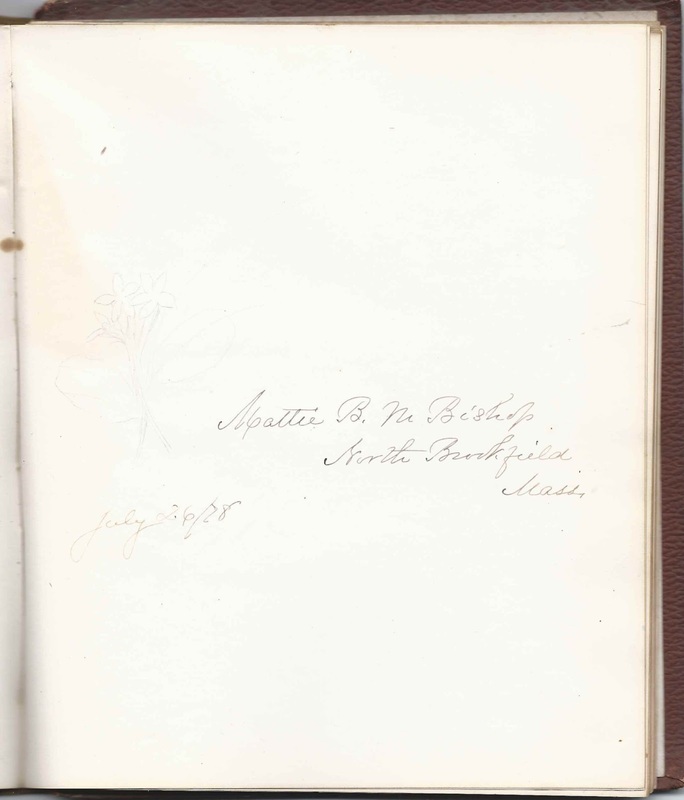 He married Sarah Rollins Philpot in April 1842. 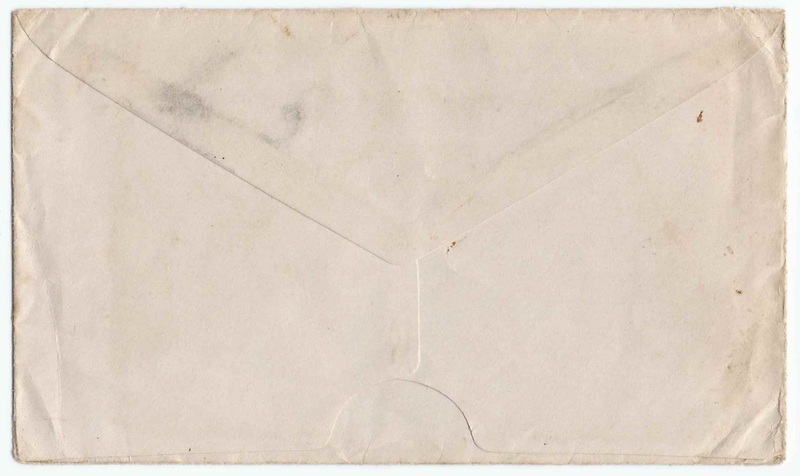 J. H. Kimball was a postmaster and eventually went to work for the Post Office Department at Washington, D.C. He was living with his son Edward and family at Washington, D.C., at the time of the 1900 Census; his wife Sarah had died by then. 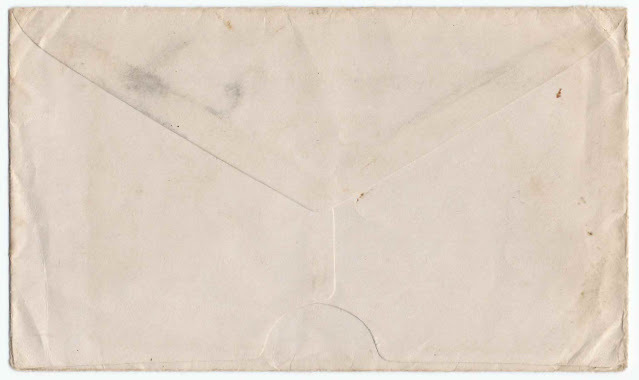 If you have corrections to the information above or feel that one or more of the people described is not the person mentioned in the document, please leave a comment or contact me directly. 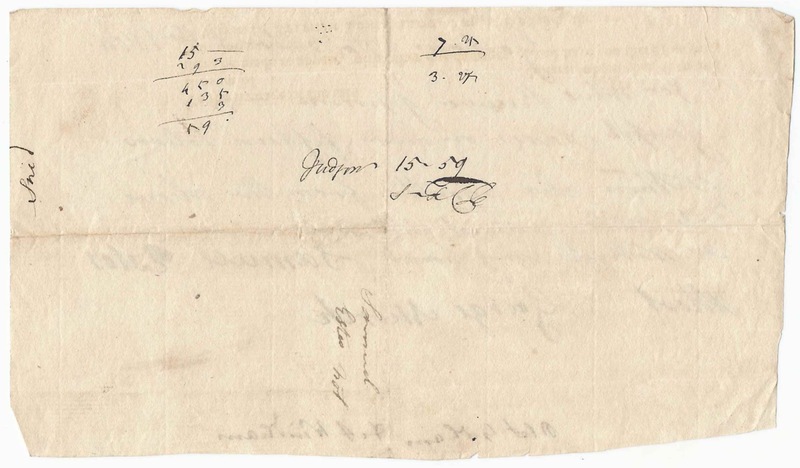 Handwritten Gorham, Maine, document dated November 3, 1804 where Samuel Estes promised to pay Joseph Nason fifteen dollars within six months with interest. 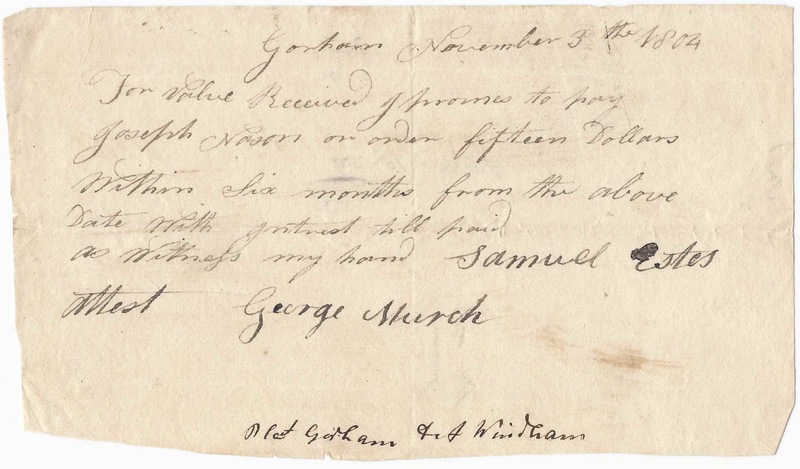 The transaction was witnessed by George Murch. 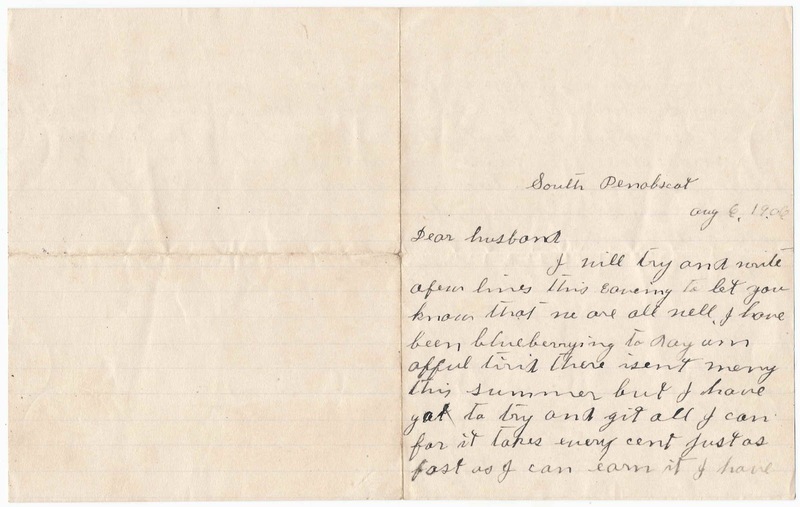 The document mentions Gorham and Windham at the bottom. For value Received I promise to pay Joseph Nason or order fifteen Dollars Within Six months from the above Date with interest till paid. 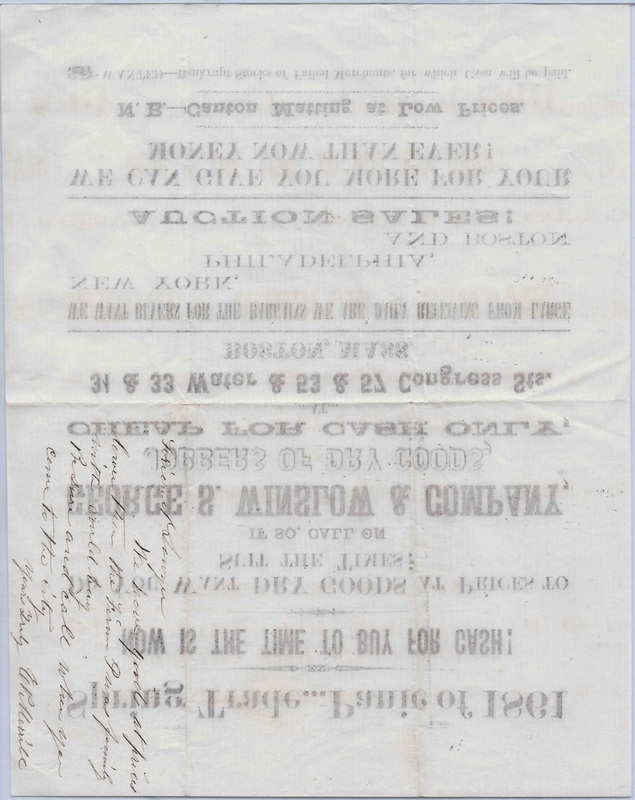 Joseph Nason was presumably the Joseph Nason who was born January 30, 1783, son of Uriah and Abigail (Knight) Nason. Joseph married Elizabeth Waterhouse; they had four daughters: Almira, Mehitable, Abigail and Dorcas. Joseph died April 8, 1860. 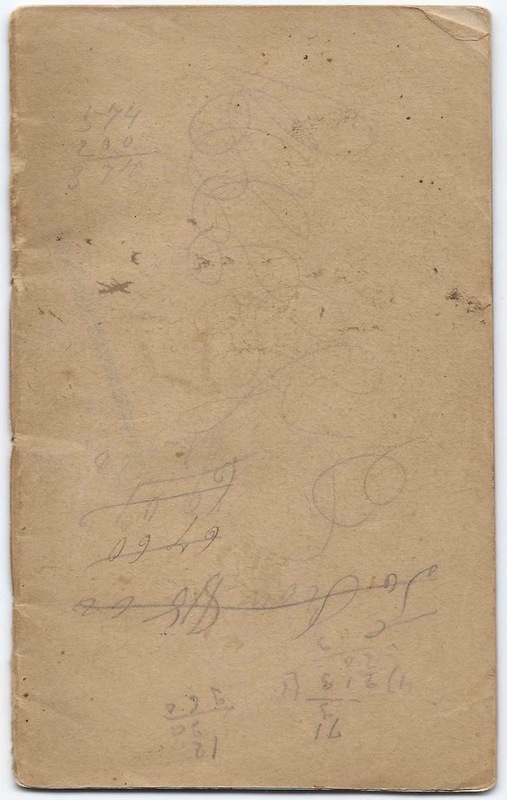 I'm not sure which Samuel Estes it was who signed this document. There was a Samuel Estes who died at Windham, Maine, on May 22, 1817, according to a transcription of cemetery records at the Windham, Maine, Historical Society, though most online trees note that he died in 1818, so I'm not sure if one or the other was a transcription error. 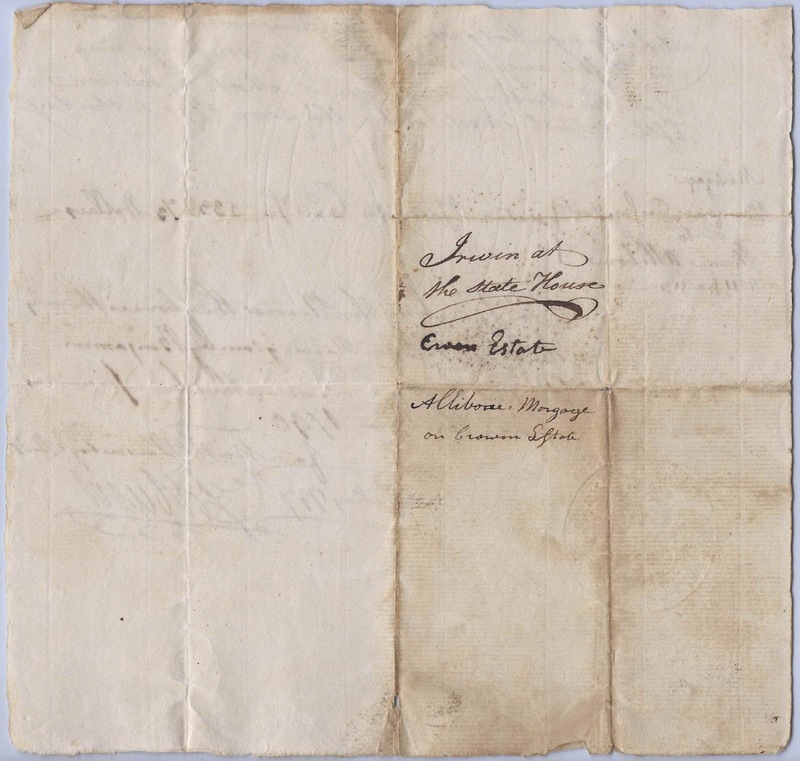 This Samuel Estes was born 8 December 1751 at Berwick, Maine, son of Henry and Mary (Varney) Estes. He married Eunice Cobb; they had a large family. George Murch may have been the George Albert Murch who was born 8 February 1767 at Gorham, Maine, son of John and Anna (Dean) Murch. 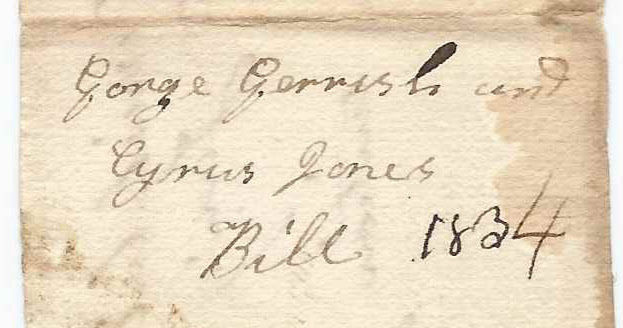 That George married Hannah Roberts on January 1, 1791 at Gorham, Maine.